Who else has filled their cookie anonymous punch card? Cookies are too convenient and too delicious and to be placed under our ‘foods to avoid’ list. Unfortunately, most cookies that daunt us from the market shelves can rack up to a whopping 300+ calories (not always the good kind either). So for all my cookie monsters out there…. this one’s for you! In a hurry, they make a great grab-and-go breakfast. Flaxseed is the binding ingredient in these little baked goods. Flaxseeds are high in omega 3’s, a good source of protein and packed with fiber (1 tbsp contains almost 2g!). 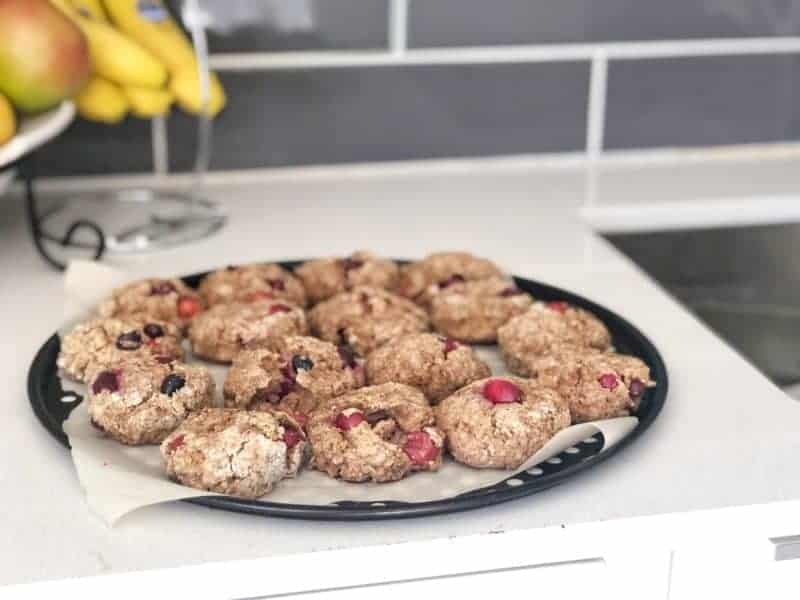 Whole cranberries not only offer the cookies a slight tarty kick, but are high in vitamins C, A, and K, and antioxidants. Oats- High in protein, fiber, various vitamins and minerals including manganese. A mineral that plays an important in bone health, metabolism, regulating sugar in the body and more. Oats also contain antioxidants, can aid in lowering cholesterol and weight loss, and can improve blood sugar levels. So yeah….there’s not a whole lot oats can’t do. 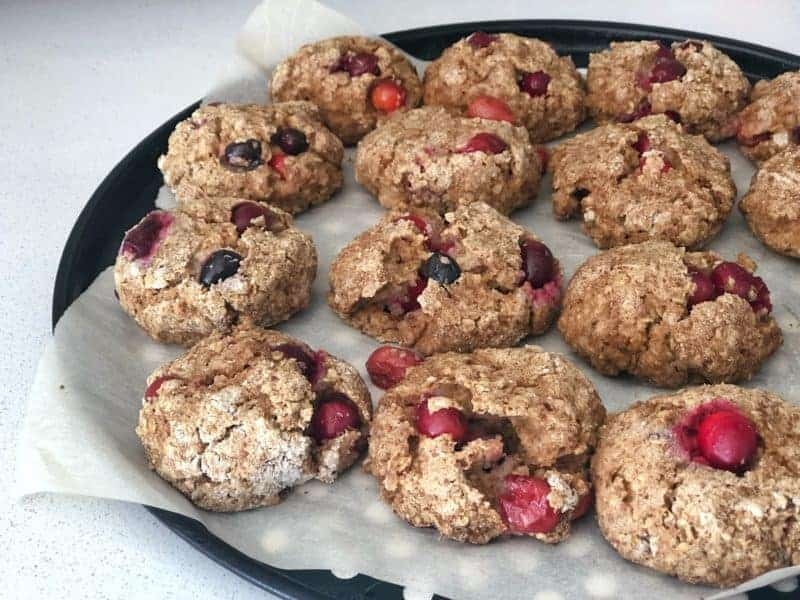 Apples, vegan protein powder and a pinch of stevia are what makes the cookies slightly sweet without adding any artificial, processed sugars. The added cinnamon helps stabilize blood sugar (no more mid-afternoon crashes), helps regulate metabolism and fight insulin resistance (important for people who are pre-diabetic), and taste delicious, so there’s that. You get the picture. They’re healthy and delicious. Chop 1 apple into quarters and place in blender with a splash of water. Blend until smooth. Add flax seed, coconut oil, nut milk, and vanilla, and blend again for about 20-30 seconds. Chop the other apple into small pieces about 1/2”. 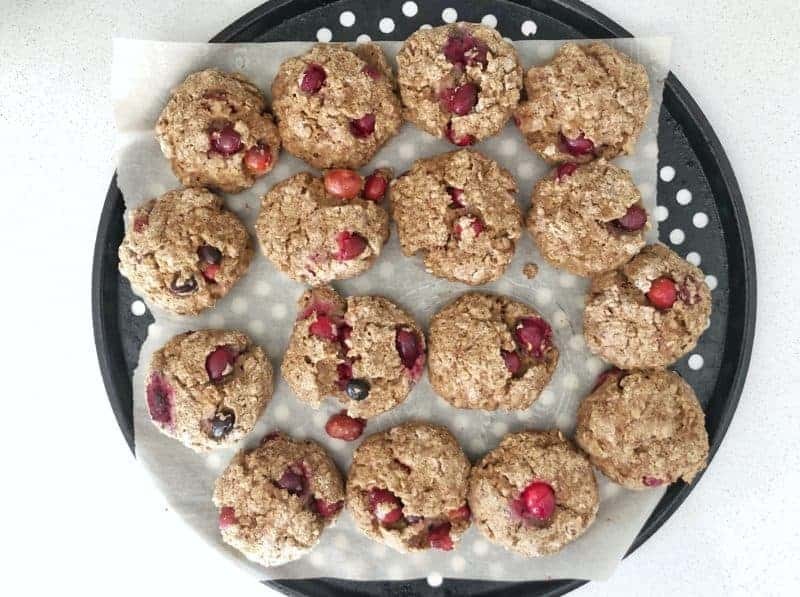 In a bowl add flour, baking powder, protein powder, stevia, cinnamon, oats, salt, apple pieces, and cranberries and mix. Add all wet ingredients with dry ingredients and mix well. Place parchment paper on a baking sheet and begin to scoop out dough forming with your hands. Cookies should be slightly round and not quite the size of your palm. If your making these with your ex-quarterback, giant hand uncle, adjust accordingly. Bake for 25-30 minutes or until slightly starting to brown. Take out of the oven and allow to cool before devouring. As difficult as this may be. Are you struggling at making your ideal weight? Or feeling lost/confused/fed up with what to eat? Put all your worries and frustration to rest.